Between clubs, dining halls, libraries, institutions and good addresses in the country, R.B. McDowell, born in September 1913, had led the charmed and energized existence of a distinguished bachelor don, embellishing the lives of generations of students - chiefly Trinity College undergraduates - fellow historians, academic colleagues and friends. 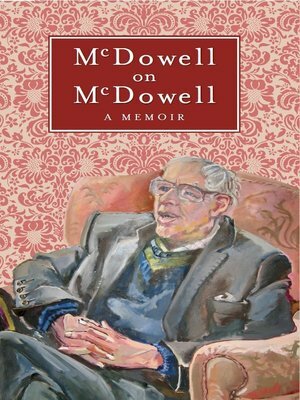 In McDowell on McDowell, A Memoir, he describes this life, almost entirely shaped by a seventy-five year association with Trinity College, Dublin, with interludes at Radley, Oxfordshire during the second world war, in London after official retirement in 1981 and on the Continent for vacations. With spare, poised prose, which reveals as it conceals, he tells of origins in Edwardian Belfast and evokes memories of secondary education at &lsquo;Inst' and Elmwood Sunday School, annual visits to London, and summers at Fahan and Portadown. He survives the Spanish flu epidemic of 1918, and experiences widening social and intellectual contours informed by avid reading in military history, eighteenth-century British politics, nineteenth-century fiction, Adam Smith, Marx and Spengler. In 1932 he progresses to TCD as lecturer, historian and writer, coming to identify with eighteenth-century Ireland - its buildings, politics and people - as the primary focus of his interest and work in a moving expression of its ethos and his own. He also provides fascinating, vivid cameos of Europe in crisis: visiting Cologne in January 1939, and in May 1968 joining student radicals on the Boulevard St Germain in Paris, an experience turned to account as he dealt with home-grown Internationalists in his capacity as Junior Dean (1956-69). This entertaining essay is self-portraiture, conveyed with the perception and ease of an after-dinner speaker and raconteur, alive to the idiosyncrasies and vagaries of his profession, is a valuable record of a unique Irishman and citizen of the world at the close of his days. The Lilliput Press has published four of R.B. McDowell's previous works: Land and Learning: Two Irish Clubs (1993), Crisis and Decline: The Fate of Southern Unionists (1997), Grattan: A Life (2001) and Historical Essays, 1838-2001 (2003).